Chelsea midfielder Cesc Fabregas has provided an update on his comeback from injury and the Spaniard sounds very positive about the progress being made. After featuring in the defeat to Manchester City in their Community Shield clash last month, he’s been absent since with a knee injury for the start of the Premier League campaign. 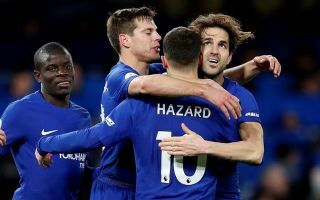 That in turn has led to summer signings Jorginho and Mateo Kovacic staking their claim for a regular role in the starting line-up at Stamford Bridge, along with the likes of N’Golo Kante and Ross Barkley as Fabregas appears to have fallen down the pecking order. While the 31-year-old described his injury as a “bit of a nightmare”, he insists that he’s now starting to see “light at the end of the tunnel” in his recovery as he will look to try and fight his way back into the plans of Maurizio Sarri, as seen in the video below. As noted by the Metro, the midfield star has been linked with an exit in January or next summer with both AC Milan and Inter credited with an interest. In turn, whether it’s to earn himself a new deal with his current contract set to expire at the end of the season or to prove his worth to potential suitors, Fabregas will be hopeful of playing regularly again sooner rather than later and it will be a welcome boost for Chelsea too given the busy upcoming fixture list. Sarri has the Europa League, FA Cup and League Cup to also consider, and so having all his options available in midfield could prove to be crucial as the weeks go on. ‘Now I’m seeing the light at the end of the tunnel!’ ?